Not a breath of wind caresses the snow-blanketed vineyards. The tar-black sky is pin-pricked with stars, and a full moon sends shadows slithering out between the scarecrow vines. Stooped figures in Arctic gear coax their bare fingers to snap off bunches of frozen grapes. That’s what the annual icewine harvest looks like in Niagara at this time of the year. It results in a wine that combines the sweetness of lusciously ripe fruit with a silver edge of acidity that’s as crisp as the winter wind. 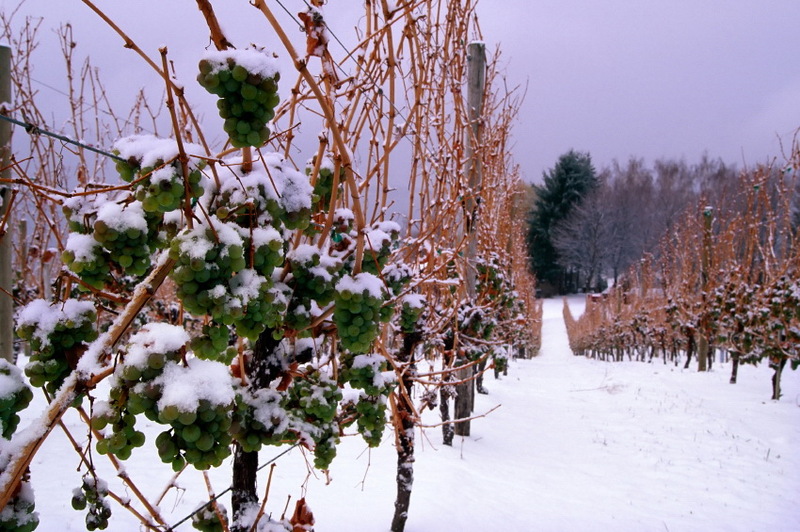 Despite its modern association with Canada, icewine was actually discovered in Germany, by accident, in 1794. Vintners were preparing for the harvest when an unexpected early frost froze the grapes on the vine. The vintners pressed them anyway, and were delighted to learn that the resulting wine was not only drinkable, but exceptionally sweet and delicious—thanks to the concentration of sugar in the frozen dehydrated grapes. 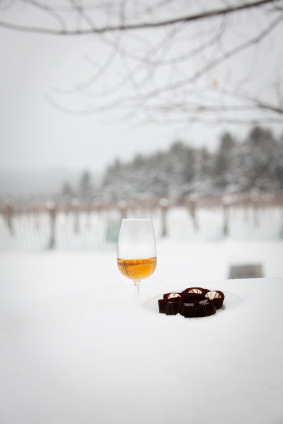 The ideal climate for icewine is one where winter freezes are erratic. Germany and Austria can produce eiswein, but Canada has long since surpassed them because of consistently colder weather. Canada was first recognized in international competition for its icewine when Niagara’s Inniskillin Wine Estates won France’s Grand Prix d’Honneur in 1991, beating out more than four thousand of the world’s best wines. Most of Canada’s icewine is made in the Niagara Peninsula. About 450 million years ago, a Jurassic sea retreated and left behind the Niagara Escarpment, a ridge of limestone deposit that’s similar to the soils of the great French wine regions such as Champagne and Burgundy. The Escarpment, defined by Lake Ontario and the Niagara River, protects vines from extremes of cold and heat; and Lake Ontario helps by releasing stored-up heat in winter and offering welcome coolness in the summer. 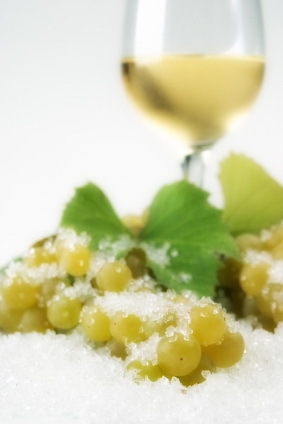 Most icewine is made from the vidal grape, which is ideally suited for icewine. The grape ripens late and has a thick skin that can withstand rot, disease and the freeze-thaw cycles; a stubborn determination to cling to its stalk despite wind and snow; intensely aromatic fruit aromas and flavors; and a high acidity that balances the sweetness in the finished wine. Some vintners also use riesling grapes to make icewine, though they’re not as hardy as vidal but they have more vibrant acidity and are considered more elegant, balanced and long-lived. Some vintners are experimenting with new grapes for icewine, such as pinot blanc, chenin blanc, gewürztraminer, and chardonnay. And in 1997, Inniskillin made its first red icewine from cabernet franc grapes. Red icewine looks pretty, with its jeweled tones of red and fuchsia. However, the taste doesn’t appeal to all palates. Several wineries, including Innsikillin, Magnotta and Pilliteri Estates, have started to make sparkling icewines as well. These blend refreshing fruit flavors with palate-cleansing acidity and an effervescence that softens the perception of sweetness. Some see this as the ultimate blend of the world’s two most luxurious wines, but others find the combination of fizzy and sweet odd. Click on the arrow to play the video above. You can expand this video to full screen by clicking the square in the bottom right corner. Canada’s first icewine was made in 1973, and sales are now some $45 million a year. Ninety percent of that is made in Ontario, by about 75 wineries, and the rest is produced in British Columbia, Quebec and Nova Scotia. Unlike most wines, for which the standard is the 750ml bottle, icewine comes in 375ml half bottles. They sell for around $50, though in Japan, where the wine is considered a rare luxury, the price can go as high as $250. Although sales of icewine account for less than 5 percent of the $1 billion of Canadian wine every year, it still represents more than half of Canadian exports and is a vinous ambassador for the industry. 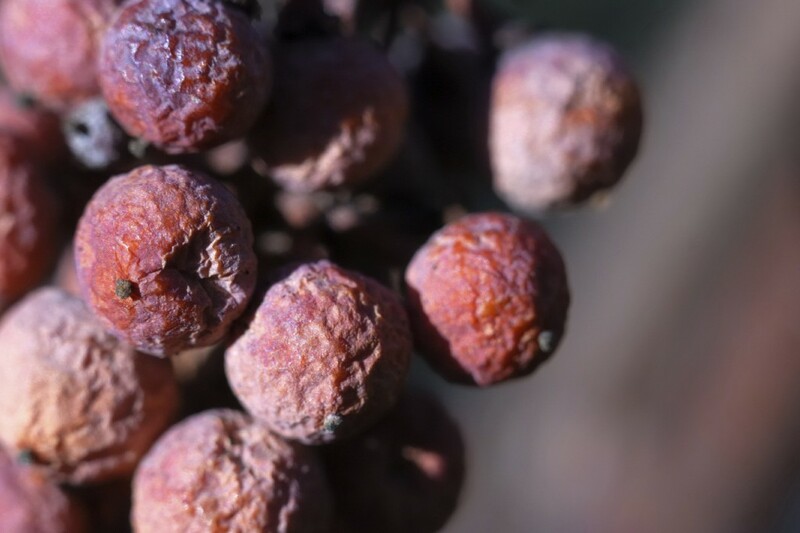 The difference between #icewine and European sweet #wines, such as French sauternes and barsac, Hungarian tokay and other late-harvest wines is a matter of cold versus rot. Many traditional dessert wines depend on the action of the benevolent fungus botrytis cinerea—commonly called “noble rot.” This fungus pierces the grape skins, allowing the water to evaporate and thereby concentrating the juice. While the aromas and flavors of botrytis-affected wines are alluring, the fruit can be harder to identify than in icewine, which preserves its freshness and purity like a crystalline ice cap gleaming in the winter sun. Inniskillin, the first in Canada to open after Prohibition, was founded thirty-two years ago by Karl Kaiser and Donald Ziraldo. It’s now Canada’s largest producer of icewine. Karl Kaiser grew up in Austria, where he learned to make wine while attending high school in a Cistercian monastery. When he emigrated to Canada in 1969, Kaiser decided to make his own wines. While buying vines at Ziraldo Nursery in Niagara, he asked for grapes that didn’t “taste Canadian” as he wasn’t a fan of local wines. Donald Ziraldo, whose Italian parents made wine, overheard him. They fell into conversation and later brought over a bottle of wine he had made from the chelois grape. They made some wine together, became friends and eventually founded Inniskillin in 1974. 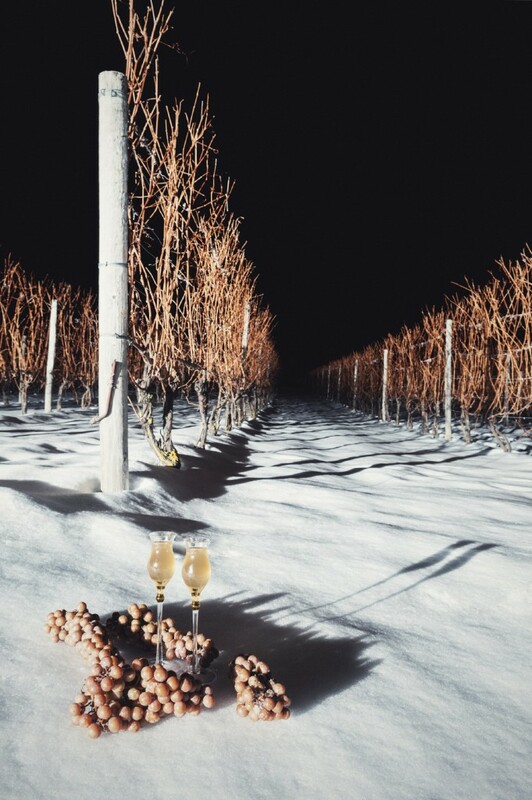 After the October harvest in 1983, Kaiser left several rows of vines unpicked in the vineyard adjacent to the winery, so he could experiment with making icewine. Kaiser’s grapes sweetened on the vine until early in the morning on December 3, when a black cloud of starlings swooped down in peckish delight and stripped the vines clean in just thirty minutes. That was Kaiser’s first hard-learned lesson for making icewine: always net the grapes. However, netting can cause its own problems. Walter Strehn, a winemaker at Pelee Island Winery, found himself entangled with the law the first year he tried it. After some birds accidentally got ensnared in his nets, the provincial ministry of natural resources fined him for “trapping birds out of season.” (Fortunately, the charges were dropped.) Today, winemakers use special netting that doesn’t trap birds and some also have “bird bangers”: automatic devices that make a loud noise to scare the birds away. Aside from wildlife depredations, making icewine is a difficult, risky business—and not a pretty one: rows of brown shriveled marbles hang from brittle, leafless vines. As the grapes hang, they develop concentrated fruit flavors. They can’t be picked before November 15, according to the Canadian wine authority, the Vintners Quality Alliance (VQA), although some harvests have gone as late as March waiting for cold enough weather. Picking in January can mean a crop loss of as much as 60 percent compared to the fall harvest, and each week past mid-January can mean another 10 percent drop. In poor years, losses can be severe. In 1997, for example, when El Niño caused freakishly warm weather, icewine producers lost 75 percent of their crops. The VQA also requires the grapes to be picked and pressed at a temperature of -8oC or colder. That’s why grapes are typically picked at night so that the concentrated winter nectar isn’t diluted by melting. If that does happen, the wine must be labeled as “late harvest” rather than icewine. At -14oC, however, the grapes yield too little juice, and that miniscule amount is so sweet that the yeast can barely survive to start fermentation. One year, Inniskillin started pressing at midnight—and didn’t see a dribble of juice until 8 a.m. During the night, the vinous pellets broke two wine presses. 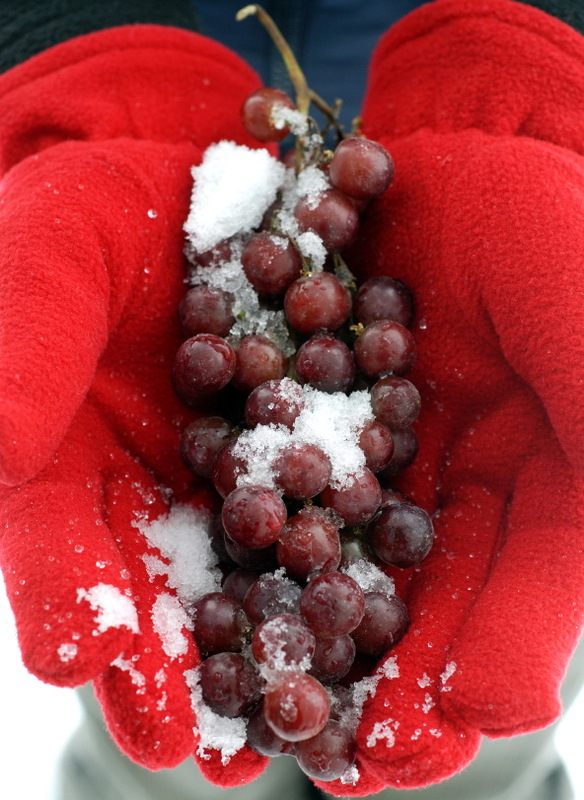 The yield of juice for icewine is only 15-20 percent of unfrozen grapes. Winemaker Klaus Reif, of Reif Winery, keeps a digital thermometer in his bedroom in the countdown to harvesting time. When the temperature dips down to -10oC, he picks up the phone and calls his pickers—who must then tumble out of their warm beds and into the frosty night. The thermometer may read -10oC or so, but the wind chill makes the night feel more like -30oC. You’d think that’s the kind of job that most people would be grateful not to have. But amazingly, some people actually volunteer to help pick the grapes, some traveling many miles to do so. A few well-heeled folks have even paid hundreds of dollars, in charity auctions, for the privilege of being part of this bacchanalian ritual. Despite the knifing cold, which makes one fantasize about any form of warmth (log fires, wooly sweaters, Caribbean beaches), there’s a kind of magic to a midnight harvest, when the full moon illuminates the scarecrow vines and the snow blankets the need to talk. Icewine seems to be almost a sacred ritual, or at least a precious secret—a wine created by stealth. Despite the lure of volunteering, most pickers are paid. Experienced pickers can fill a forty-pound basket in ten minutes, with a deft wrist movement to snap the bunches off the vines. One wonders if it wouldn’t be easier to skip the keen cold while the grapes are wheeled into a big freezer back in the fall? Some producers do take that tack in California, Australia and other regions where the temperatures don’t get cold enough to freeze grapes naturally. These places make an ersatz version of icewine they call “icebox wine” or the more elegant “glaciovinum.” The grapes are picked in the fall, then artificially frozen in refrigeration units using a process called cryo-extraction. One of the most popular of these wines, made in California, is Bonny Doon’s Vin de Glacière. However, these “freezer wines” lack the intensity and complexity of the real thing. Freezer-frozen grapes haven’t hung on the vines as long, undergoing the physical and chemical changes that give real icewines their unique aromas and flavors. 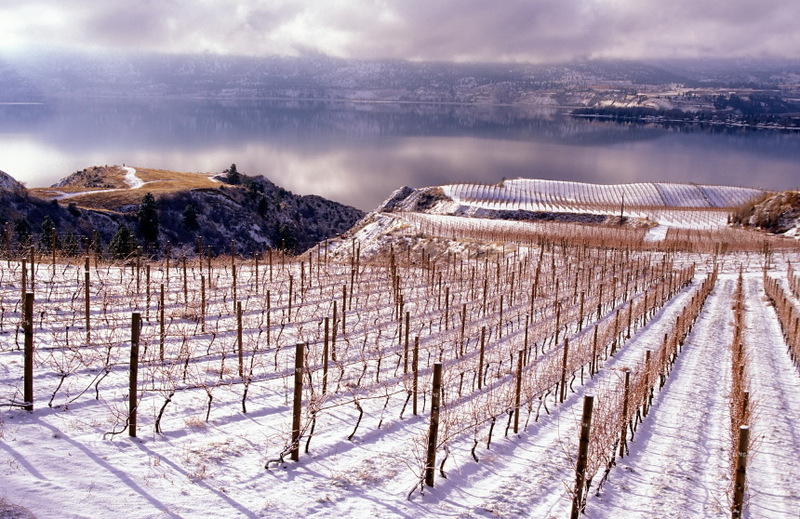 Currently, the members of the World Wine Trade Group (Canada, U.S., Chile, Argentina, New Zealand, Australia) are developing a definition of icewine, which will limit the term to wines made from naturally frozen grapes and be enforceable by law. However, the big problem isn’t so much icewine not made according to standard methods; it’s completely bogus products concocted from sugar, water and alcohol—and passed off as the real thing to unsuspecting consumers. The largest buyer of Canada’s icewine is Asia. Many are bought as gifts since Asians like to give each other prestige bottles as tokens of esteem. But the market is flooded with fakes: Alan Schmidt, winemaker at Vineland Estates, estimates that sales are down 60 percent in China because of fakes. Some of the knock-offs are highly creative with their packaging, such as one labeled as being from “Chilliwacko, Ontario” (inspired by Chilliwack, B.C. one assumes). Other imaginative brands include “Snow White” and “Elixir of the Gods from Torontow”—the latter’s label bears a picture of Whistler, a ski resort in British Columbia, more than 5,000 miles west of Ontario’s capital. Their inferior quality is no joke, though: these knock-offs damage the reputation of the real thing. When consumers believe that the sugary alcohol they’re tasting is really icewine, that hurts not only sales, but also Canada’s reputation abroad. What should authentic icewine taste like then? A good icewine warms you the way a crackling fire does when you come in from the cold on a winter’s day. The rich, viscous texture seeps over your tongue, coats it and fills your mouth like an incoming tide of pleasure. The lovely tension between acidity and sweetness makes it a more sensual experience. Classic vidal icewines deliver a delicious sensory overload, with fat, luscious notes of tropical tree fruit, such as apricot, mango, peach, lychee, clementines, honeysuckle, jasmine, baked apple, quince, pineapple, pear and melons. Riesling wines, with their sharper edge of acidity, have more mineral and citrus aromas, such as orange blossom, mandarin, and tangerine—all suspended in a gossamer haze of sweetness. The new red icewines, made from cabernet franc, merlot and pinot noir grapes, offer aromas of strawberries and raspberries, their sweet fruit flavors are balanced by their acidity (much as the sugar of lemonade is tempered by the tartness of the lemons). 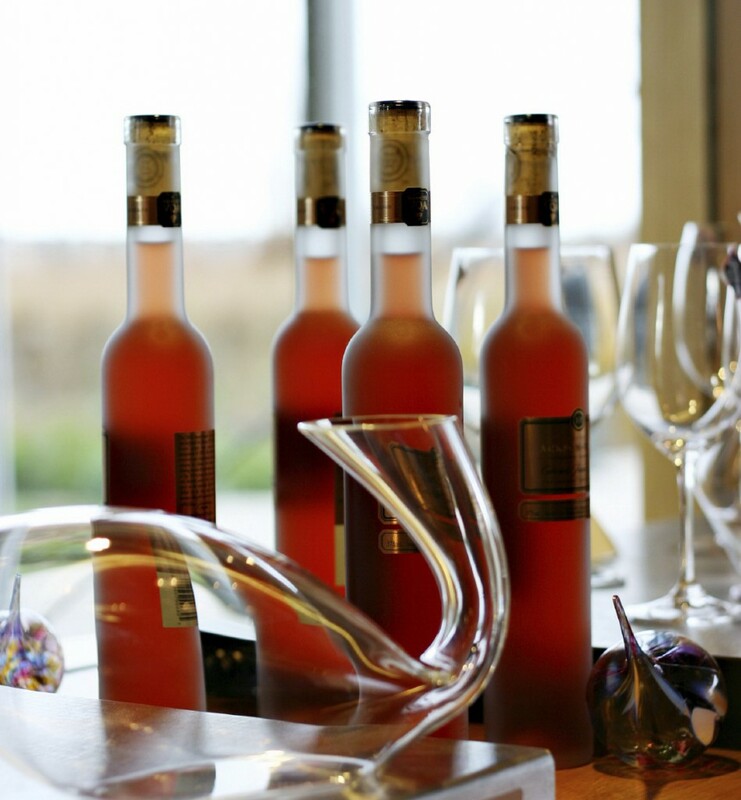 Icewine doesn’t need to be aged to enjoy its fresh fruit flavors. In fact, many producers recommend drinking their wine before they’re older than four years after they’re bottled. After a decade, icewines turn amber and their fresh fruit flavors take on more honeyed, nutty aromas. Serve icewine chilled; an hour or two in the fridge will allow it to reach the ideal drinking temperature of 45oF-50oF. The traditional time to serve it is at the end of the meal, when most people already feel full. So a half bottle will serve six to eight people with about two ounces apiece: the wine is so sweet that a little goes a long way. But just because the pour may be small, the glasses don’t have to be. Skip those tiny golf-ball-sized dessert glasses, which don’t allow enough room to swirl the wine and enjoy its aromas. Instead, use a regular white wine glass, the kind you’d use for sauvignon blanc. Or if you’re willing to splash out $40 a stem, by all means use the special icewine glass created by Riedel Crystal. You can serve icew ine alongside any of the classic first-course matches for sauternes, such as paté or pan-seared foie gras. And some icewine-food combinations glide together as smoothly as a new pair of skates over a freshly frozen lake: try it with fruity desserts like cobblers, crisps, strudels, tarts, flans and pies made from peaches, pears, kiwis or apples. Pair it with fresh figs drizzled with cream, chocolate-dipped strawberries or nutty desserts such as biscotti, almond-flour pound cake or an exotic dacquoise. Icewine also matches nicely with meats cooked in a fruit reduction or a brown-butter sauce, or served with a spiced raisin chutney. You can even offer it with the cheese course: pair it with blue or cheddar, and you’ll find the sweetness is a lovely foil to the saltiness of the cheese. Many people give a bottle of wine as a gift. Icewine is perfect because it’s a sweet treat that’s different from all the rest we indulge in at this time of year and it also has the cachet of exclusivity. Even if the recipient is a knowledgeable wine lover, chances are good that he or she won’t already have a rack full if icewines. And don’t forget to treat yourself too, after the flurry of skiing, snow-shoeing and tobogganing, it’s a lovely wine to enjoy when you come in from the cold.